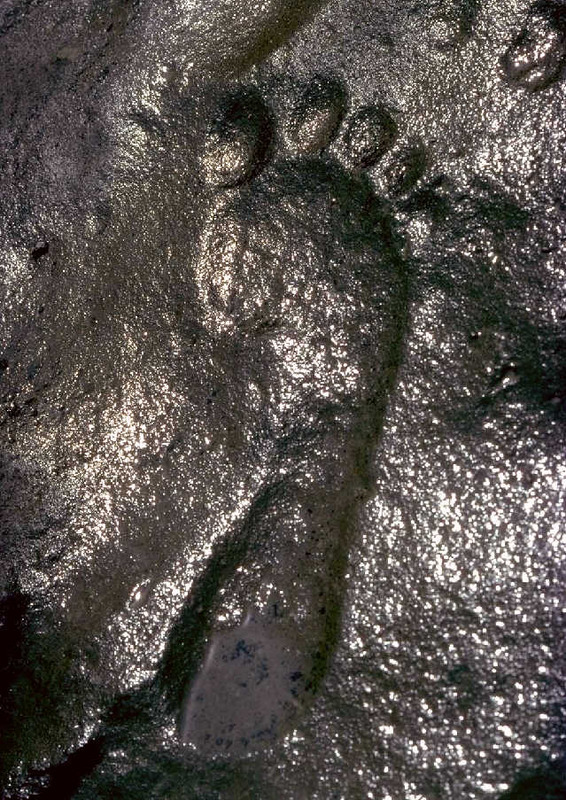 Over the years a large number of fossilized human tracks have been reported at various locations around the world. Some of these shed light on the coexistence of men and dinosaurs. The Paluxy River basin in Glen Rose Texas is the location of Dinosaur Valley State Park. Many dinosaur tracks have been found along the river and a large number have been excavated to preserve them from erosion. But there have also been human tracks found in this same rock layer. To the right is the Willet print, which was excavated from a limestone ledge near Dinosaur Valley State Park. 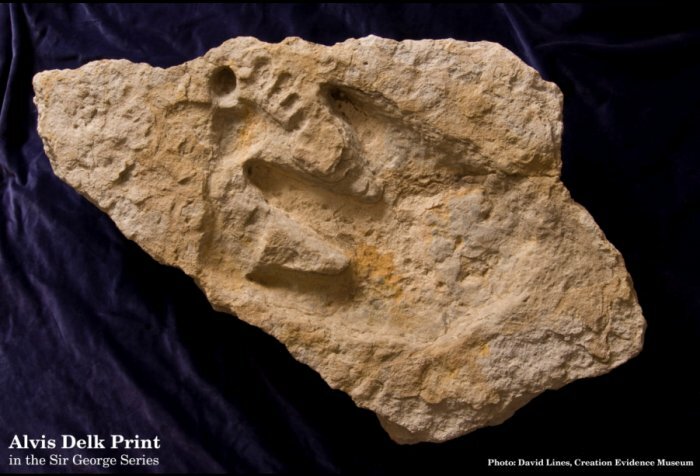 Below to the left is the Feminine Print, a “human track inside a dinosaur track,” that was found in the Paluxy River area of Glen Rose, Texas. In the center is the Delk Print, which shows a human footprint intruded by a tridactyl dinosaur print. The Delk Track has been authenticated by spiral CT scan, which can verify that there is greater compression density below the tracks then elsewhere in the rock. The right picture shows what are called “following contours” revealed by the CT scan. These would not be there if the track was carved. 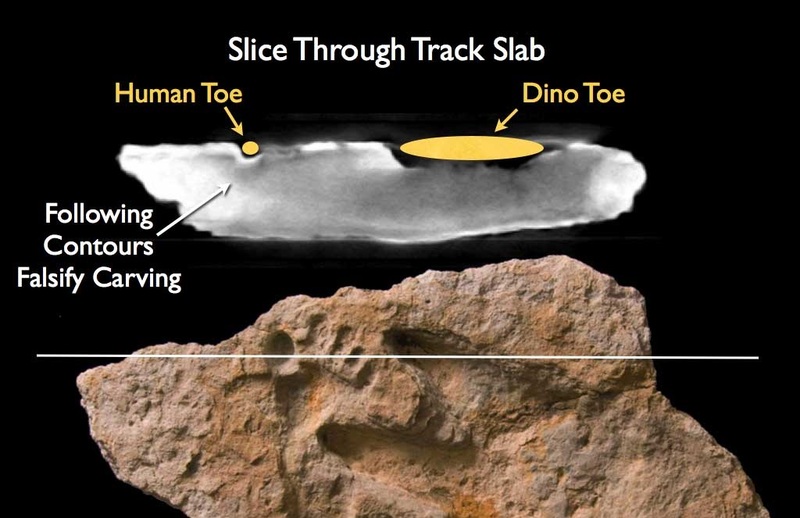 These Paluxy “man-tracks alongside dinosaur-tracks” have been the source of considerable controversy over the years. 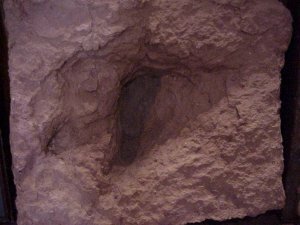 The lack of clarity regarding these original Paluxy “man-tracks” finds prompted leading creationists to cease using the Paluxy footprints as evidence for men living dinosaurs. But then additional tracks, like the Feminine Print and the Delk Track, came to light, providing much clearer evidence. 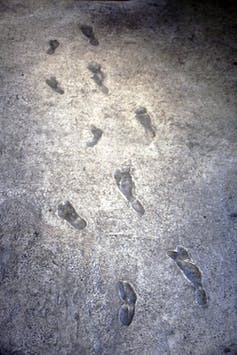 It is instructive to consider that these Paluxy human footprints are much more distinct than Mary Leakey’s famous Laetoli Track in Tanzania (left), which is universally accepted as hominid. 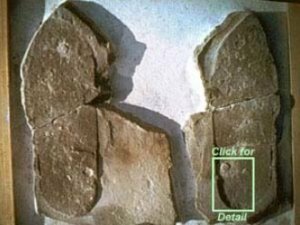 The limestone beds of the Paluxy River containing the supposed human and dinosaur footprints are thought by evolutionists to be 120 million years old. Milne and Schafersman admit, “Such an occurrence, if verified, would seriously disrupt conventional interpretations of biological and geological history and would support the doctrines of creationism and catastrophism.” (Milne, and Schafersman, “Dinosaur Tracks, Erosion Marks and Midnight Chisel Work (But No Human Footprints) in the Cretaceous Limestone of the Paluxy River Bed, Texas,” Journal of Geological Education, Vol. 31, 1983, pp. 111-123.) Incidentally, the Laetoli prints are also problematic for evolutionists because they appear fully modern and yet the rock layer is dated to 3.5-3.7 million years ago, too old for modern Homo sapiens in the current paradigm of human evolution. To the right is pictured the Zapata track, found in Permian limestone in New Mexico. The Permian is thought by evolutionary geologists to be over 250 million years old. 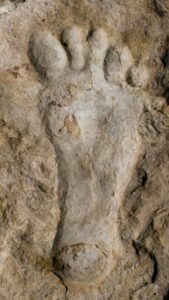 Yet there is a clear fossil human footprint. It is a very shallow track, almost invisible unless wet with strong side lighting. This accounts for the dramatic hour glass shape with dots in front, similar to what you see when you walk with a wet foot on a tile floor. Geologist Don Patton attempted to cut this print out of the rock, but wore out four carborundum blades trying to make one cut! Patton reports to have personally seen a photograph of four, virtually identical tracks in an obvious right left pattern taken about one quarter mile from the Zapata track. The rock and the tracks look virtually identical. 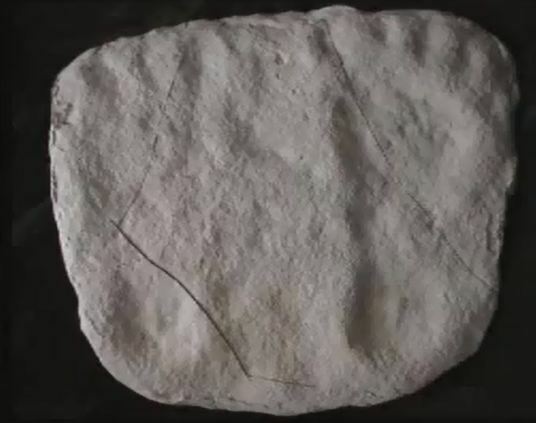 Some critics claim the Zapata print is “too perfect.” But the mud push-up on the sides and the fact that the matrix proved extremely hard to cut out (lab tests indicated it was limestone with 30% silica) would make a carving quite unlikely. 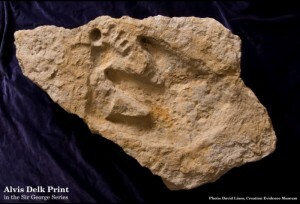 Perhaps the most intriguing such fossil footprint report was that made by the head of department at Berea college in Kentucky of a human-like track left in sandstone of the Upper Carboniferous Period. Numerous scientists have investigated these tracks and concluded that they are genuine (even going so far as to count the sand grains under magnification to ensure that it was compressed at the bottom rather than carved). In Scientific American, geologist Albert G. Ingalls writes, “If man, or even his ape ancestors, or even that ape ancestor’s early mammalian ancestor, existed as far back as the Carboniferous Period in any shape, then the whole science of geology is so completely wrong that all the geologists will resign their jobs and take up truck driving. 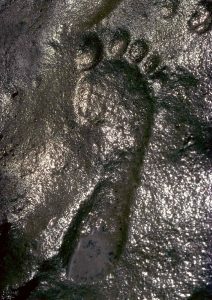 Hence, for the present at least, science rejects the attractive explanation that man made these mysterious prints in the mud of the Carboniferous with his feet.” Ingalls suggested that they were made by some unidentified amphibian. But a human-sized Carboniferous amphibian is just about as problematic for evolutionary timetables as humans in that era!